Today’s builders and contractors use Spray Polyurethane Foam (SPF) as insulation across a wide range of applications, including roofs, ceilings, and walls. They also utilize spray foam insulation in industrial settings, such as climate controlled environments, or in-between pipe fittings. At Intech Equipment & Supply, we believe the best part about the spray foam formula is you can adjust it for different use cases, depending on the needs of the application. As the general public’s interest in SPF insulation as a legitimate alternative to traditional insulating materials continues to rise, more and more contractors tell us they want to learn more about spray foam, its various application methods, and equipment. One common question we hear from contractors relates to choosing the right spray foam gun. Spray foam guns are used to apply SPF insulation onto a wall or other substrate. The spray foam gun is essential as this is where SPF’s materials meet and react. With SPF insulation, proper mixing is vital to ensure that the material properties are developed and maintained over the life cycle of the building. We believe it is crucial to pick a spray foam gun that is easy to spray, applies spray foam according to the manufacturer’s recommendations, and most importantly, is easy to maintain. What Are the Differences in Types of Spray Foam Guns? The majority of spray foam guns are available with air purge, mechanical purge, and liquid purge. If you want to learn how to choose the best spray foam gun for your next insulation job, you first must consider the project type, as well as the various options available for each type of gun. PMC spray foam guns and Graco spray foam guns are two of the most popular brands. · Are the most popular type of spray foam gun in the SPF and coatings market. · Use a blast of compressed air to keep the mixing chamber clean. · Are easier to maintain and involve fewer parts than other spray foam guns. 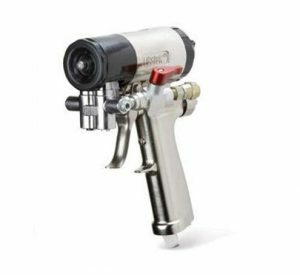 · Uses much less purge air than an air purge gun. · Keeps the mixing chamber cleaner because each trigger pull dispenses solvent into the mixing chamber. This step removes build-up material. Note: the mixing chamber must always be kept clean to ensure consistent spraying and to maintain the correct formula of materials. · Allows users to switch from small to large spray patterns quickly. · Offers the widest range of flow rates among spray foam guns. · Uses a steel rod to push any residual material out of the mixing chamber to keep it clean. · Contain more parts and requires more maintenance than air purge spray foam guns. The mixing chambers on both PMC spray foam guns and Graco spray foam guns should be appropriate for the scale of the job you need to accomplish. For example, the larger the chamber, the more material you can apply during spray time. Selecting a spray foam gun does not have to be difficult if you take the best brands, models, and styles into consideration, along with the jobs you need to complete for your customers. Intech Equipment & Supply focuses on creating great relationships with our customers and the manufacturers that build the products we provide. Our experience working with several manufacturers of SPF equipment allows us to provide the expert service that our customers expect. We are your one stop shop for SPF equipment and resources including spray foam guns, proportioners, pumps, heating blankets and more. Call us today at (866) 652-9975 for more information.